In June 2012 we reported that Feadship had sold the sixth spec-built F45 motor yacht to a Chinese client and now she's been launched, christened Blue Sky. Built at Royal Van Lent, Blue Sky differs from her sisters in being reconfigured to include a helicopter landing pad at the client’s request. 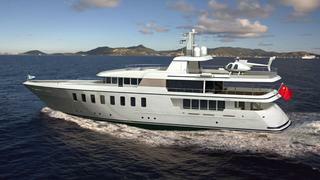 Blue Sky has naval architecture by De Voogt Naval Architects. An interior by Bannenberg & Rowell and Sinot Yacht Design will accommodate 10 guests in five staterooms and twin 1,055hp MTU engines will give her a cruising speed of 14.5 knots and a transatlantic range.